Chris Ollendike, EVP and Director of Sales explains what's different about InvestEdge's UMA solution and some of the efficiencies it provides at the 2019 ABA Wealth Management and Trust Conference. Spend less time double checking red flags and more time fostering relationships by incorporating a comprehensive approach to mitigating risk and managing compliance. Learn how from the final video of our three-part series "Maximizing the Power of UMAs." Solve integration challenges with better design and better data. Learn how from the second video of our three-part series "Maximizing the Power of UMAs." Find out how to strike the right balance between client wants and industry needs. Watch the first or our three-part video series "Maximizing the Power of UMAs." All UMA Solutions Are Not Created Equal. Many traditional UMAs fall down when it comes to creating clarity for clients and scalable efficiencies for advisory businesses. And advisors know that striking the right balance between these two goals is easier said than done. In our latest eBook we are introducing a new breed of UMA which offers more flexibility to clients while delivering operational efficiencies, control and oversight to advisors and firms. 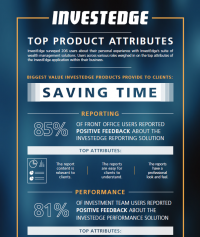 Where other UMA solutions fall down, InvestEdge's UMA stands up. 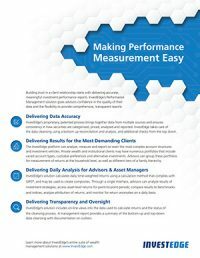 Reliable performance calculation results, translated into easy-to-understand reports are a requirement for today's wealth managers. The presentation must be provided accurately and in a timely manner, representing the performance of your client's investments.